College of Arts & Sciences has raised $ 80,099 from 640 gifts! Support the College of Arts & Sciences on #MaryWashDay! 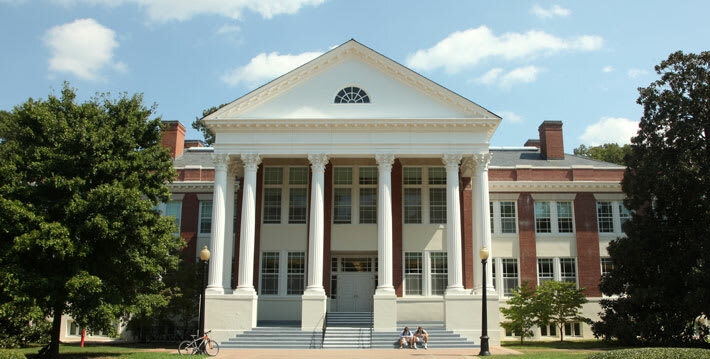 The College of Arts & Sciences (CAS) is the heart and soul of UMW. Our 19 academic departments and 200+ faculty offer over 30 cutting-edge majors that incorporate contemporary issues such as diversity, digital fluency, service, and social justice. Because UMW receives less than a quarter of its budget from the Commonwealth of Virginia, we need your help to remain competitive in providing high-impact education for our students. Such practices extend the education beyond the walls of the classroom. But these activities involve extra time, commitment, and expense if they are to succeed, which is why we need your help. Students who engage in high-impact learning programs are more satisfied with their education and graduate at higher rates than students who did not have such experiences. Isn’t that worth doing for as many students as possible? Achieving the best return on our high-impact practices means we need to provide more scholarships, better faculty support, and more options for internships, undergraduate research, and service learning. Your gift will help us achieve those goals. If you wish to designate your gift to an academic department, your gift will support programs in that department. A gift designated to the College of Arts and Sciences will support expanded opportunities for all of our students. Or you may select "Other" and enter your gift designation. FULL MATCH MET! THANK YOU, ANONYMOUS SPONSOR AND OUR BIOLOGY DEPARTMENT DONORS! Double your donation! The first $1,500 in gifts to the Biology Department will receive a dollar-for-dollar match. Made possible by the generosity of an anonymous donor! FULL MATCH MET! THANK YOU, DAVE HANSEN '17 AND ART AND ART HISTORY DONORS! Make a gift to the Art and Art History Department, and Dave Hansen '17 will match it with an equal gift to the JeanAnn Dabb Memorial Fund in Art History, which benefits travel needs of students within the department. This is your chance to double your impact when you support Art and Art History on Giving Day! To qualify for this match, choose "College of Arts and Sciences" as your Area of Support and "Art and Art History Department" as your Fund Designation. FULL MATCH MET! THANK YOU, ASHLEY DEMANDER '07 AND OUR CHEMISTRY DEPARTMENT YOUNG ALUMNI DONORS! Calling all Chemistry alumni of the 2000s! Ashley Demander ’07 will match all Giving Day gifts to the Chemistry department from the classes of 2000 through 2018 dollar-for-dollar, up to $1,000 total. DOUBLE your impact and help the Chemistry department purchase a new NMR! To qualify for this match, choose "College of Arts and Sciences" as your Area of Support and "Chemistry Department" as your Fund Designation. Janet F. Wishner, Professor Emerita of Philosophy, and Marsha Lynn Wilkins '62 are matching all gifts to the Classics, Philosophy, and Religion department's Elizabeth A. Clark Lecture Fund, up to $3,500! Gifts will support a lecture series featuring renowned scholars in the field of late antiquity. To qualify for this match, select "College of Arts and Sciences" as your Area of Support and "Classics, Philosophy, and Religion - Elizabeth A. Clark Lecture Fund" as your Fund Designation. Keith '79 and Ellen Erskine Littlefield '79 are matching ALL gifts to the Geography Alumni Scholarship! To qualify for this match, choose "College of Arts and Sciences" as your Area of Support and "Geography Alumni Scholarship" as your Fund Designation. DOUBLE your impact with your gift to support Geography students! CHALLENGE UNLOCKED! THANK YOU JEFF ROUNTREE '91 AND OUR GEOGRAPHY ALUMNI SCHOLARSHIP DONORS! In honor of the Geography department's 60th anniversary, Jeff Rountree '91 will give $4,000 to the Rountree Endowment for Geography when 60 gifts are received to the Geography Alumni Scholarship. Unlock this challenge gift by choosing "College of Arts and Sciences" as your Area of Support and "Geography Alumni Scholarship" as your Fund Designation. FULL MATCH MET! THANK YOU, PROFESSOR DAWN BOWEN AND OUR GEOGRAPHY ALUMNI SCHOLARSHIP DONORS! Don’t be late! Professor Dawn Bowen will match all gifts to the Geography Alumni Scholarship from 8 to 10 a.m., up to $500. To qualify for this match, select "College of Arts and Sciences" as your Area of Support and "Geography Alumni Scholarship" as your Fund Designation. FULL MATCH MET! THANK YOU, GLENN MARKWITH '76 AND OUR GEOGRAPHY ALUMNI SCHOLARSHIP DONORS! “Topo” the morning to You! Glenn Markwith ’76 will match all gifts to the Geography Alumni Scholarship from 10 a.m. to noon, up to $300. To qualify for this match, select "College of Arts and Sciences" as your Area of Support and "Geography Alumni Scholarship" as your Fund Designation. FULL MATCH MET! THANK YOU, ASSISTANT PROFESSOR CAITIE FINLAYSON AND PROFESSOR STEPHEN HANNA AND OUR GEOGRAPHY ALUMNI SCHOLARSHIP DONORS! All in for field work, field trips, and other reasons geographers are “Out Standing in the Field!” Assistant Professor Caitie Finlayson and Professor Stephen Hanna will match all gifts to the Geography Alumni Scholarship from 12 to 2 p.m., up to $250. To qualify for this match, select "College of Arts and Sciences" as your Area of Support and "Geography Alumni Scholarship" as your Fund Designation. FULL MATCH MET! THANK YOU, ASSOCIATE PROFESSOR JOE NICHOLAS AND ASSOCIATE PROFESSOR JACKIE GALLAGHER AND OUR GEOGRAPHY ALUMNI SCHOLARSHIP DONORS! Get your feet muddy! Associate Professor Joe Nicholas and Associate Professor Jackie Gallagher will match gifts to the Geography Alumni Scholarship from 2 to 4 p.m., up to $300. To qualify for this match, select "College of Arts and Sciences" as your Area of Support and "Geography Alumni Scholarship" as your Fund Designation. FULL MATCH MET! THANK YOU, PATTY MIMS' 92 AND OUR GEOGRAPHY ALUMNI SCHOLARSHIP DONORS! Geographers are “all in” for study abroad! Patty Mims ’92 will match gifts to the Geography Alumni Scholarship from 6 to 9 p.m., up to $500. To qualify for this match, select "College of Arts and Sciences" as your Area of Support and "Geography Alumni Scholarship" as your Fund Designation. FULL MATCH MET! THANK YOU, PROFESSOR JACK KRAMER AND HIS WIFE MARY LOU AND OUR POLITICAL SCIENCE AND INTERNATIONAL AFFAIRS DEPARTMENT DONORS! Professor Jack Kramer and his wife Mary Lou will match all gifts to the Political Science and International Affairs department on Mary Wash Giving Day, up to $2,019. This is your chance to DOUBLE your impact! To qualify for this match, choose "College of Arts and Sciences" as your Area of Support and "Political Science and International Affairs Department" as your Fund Designation. UPDATE: HIS ORIGINAL $3,000 MATCH WAS FULLY MET, SO STEVE HAMPTON DECIDED TO UP IT TO $5,000! CALLING ALL PSYCHOLOGY ALUMNI TO DOUBLE YOUR IMPACT! Retired professor Steve Hampton will match the first $5,000 in gifts to the J. Christopher “Topher” Bill Scholarship for Psychology students. Make your gift early to double your impact before the matching funds run out! To qualify for this match, choose "College of Arts and Sciences" as your Area of Support, and "Psychology - J. Christopher 'Topher' Bill Scholarship" as your Fund Designation. Which department in the College of Arts and Sciences is receiving the most gifts?